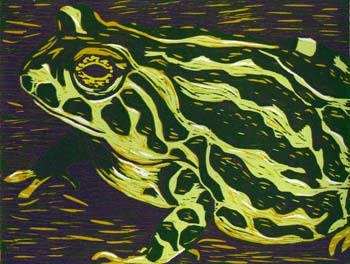 When I was looking for artistic representations of Houston Toads a few weeks back for my post AFTA Goes to Texas I ran across a very talented printmaker who I am happy to feature on today’s ECO Art + Science post: Lisa Studier. 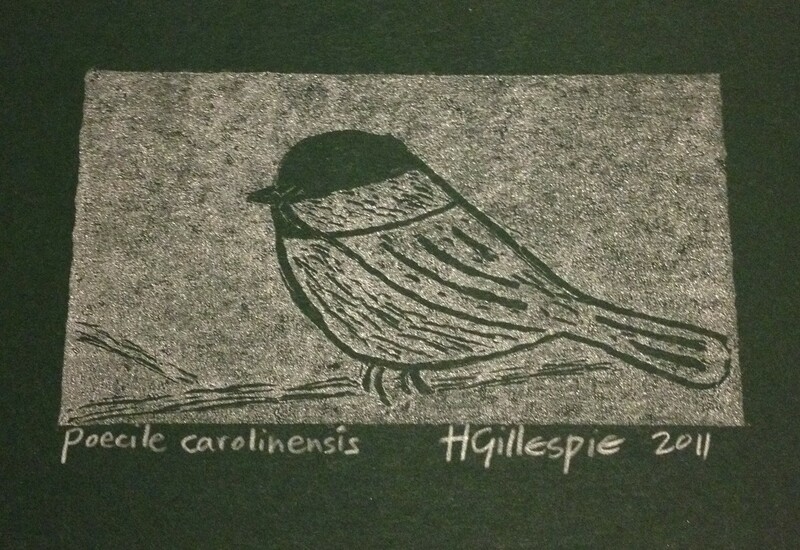 Lisa’s work in woodcut reduction printing is not only beautiful, but also educational, as she does a great deal of background research and strives to provide information about the plight of each species she prints. Lisa’s lively and engaging portraits help people build a connection with each species, which may help them to better appreciate the conservation messages embedded in her work and to better understand global threats to biodiversity. Houston Toad. 2010. Reduction woodcut print by Lisa Studier. [biocreativity] Hi Lisa, welcome to the biocreativity blog! What type of work do you do? How would you describe your interests and profession? 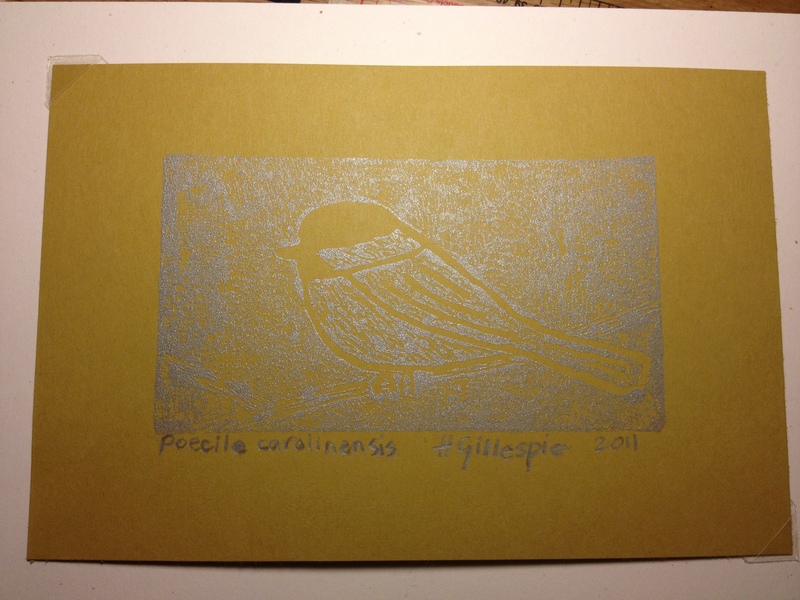 [LS] I’m a printmaker, and I make woodcuts. I’ve been working exclusively in this technique for the past eight years. I love it, but I don’t make a living doing it—just fit it in as best I can in my free time. I’ve always worked full-time, until recently in jobs that were not art- or science-related in any way. But since 2006 I’ve been working as a librarian at the New York Botanical Garden, which has one of the largest plant science research collections in the world, so it’s nice to have my “day job” and my interests intersecting a bit more. My science interests are kind of broad: natural history, ecology, conservation, biodiversity, endangered species. Platypus. 2008. 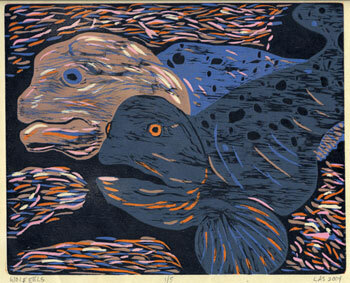 Woodcut print by Lisa Studier. [biocreativity] Where do you see yourself on the biocreativity spectrum? Closer to the arts end or the science end? What is your primary training (art or science)? [LS] Definitely closer to the arts end, although I don’t have much formal training. I have a B.A. in History and a Masters in Library Science. I took a lot of art history classes as an undergrad, but didn’t do any studio art until I moved to NYC in the mid-90’s and started taking drawing and painting classes. 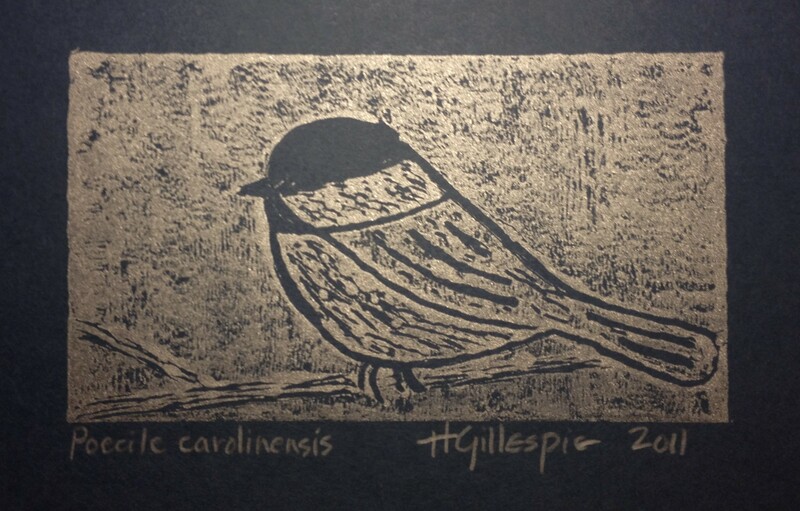 Eventually I stumbled upon a woodcut class and just took off from there. I had some fantastic teachers and all those years of drawing classes were a great foundation once I started making prints. Also the collaborative atmosphere of a printshop is something I love about printmaking: the need for shared equipment means you’re around other artists all the time rather than working alone in your own studio, and that offers a lot of opportunities to learn and grow as an artist. I don’t have any science training beyond doing lots and lots of reading, although this semester I’m finally taking a botany class at my workplace, which is very exciting. Orang Roughy. 2004. 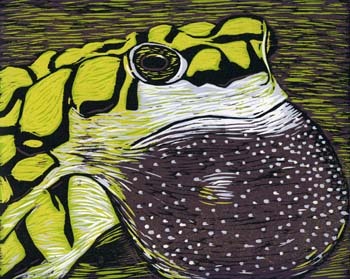 Reduction woodcut print by Lisa Studier. [biocreativity] That sounds like a lot of fun! Lisa, how do you view the interaction of arts and sciences? Can they be separated? How does one inform the other? [LS] I don’t think they can be separated at all. For one thing, the visual display of information is vital to learning. When I look at my botany textbook, for example, I can’t imagine really understanding it without all the illustrations and photos and diagrams. So art is an important teaching tool, that seems like a no-brainer. But the interaction can be so much more: images are very powerful, and people have an emotional reaction to them that can really make an idea or concept stick. 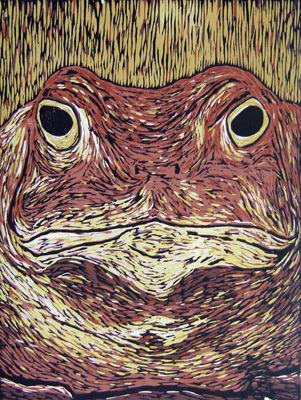 Science can seem detached and dry; I know when I talk about endangered toads in the abstract I often see eyes glazing over, but when someone is looking at my toad prints they’re suddenly much more engaged, and they want to know about the toad and the issues affecting it, and I think (hope?) they retain the information better and maybe care more about the issues than they would without the image. Sonoran Green Toad. 2010. 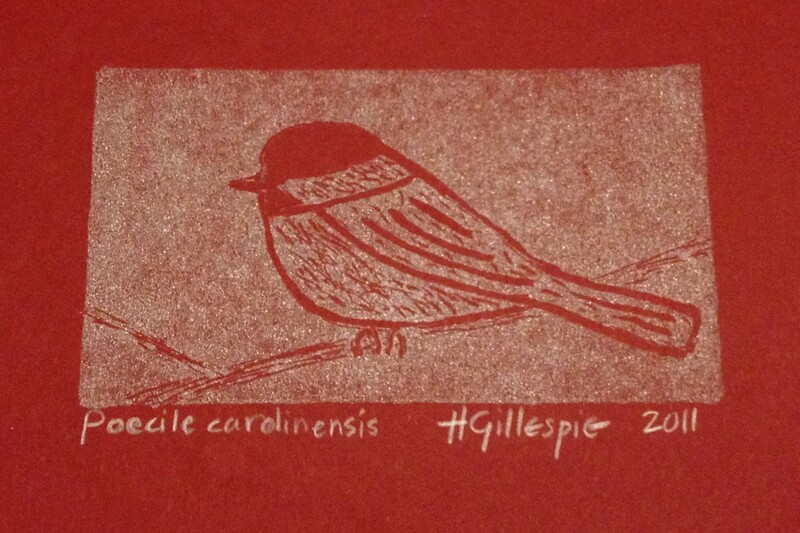 Reduction woodcut print by Lisa Studier. So art has enormous potential for communicating scientific information because it can have such an emotional pull on people, and I also think science can inform art by making it more rigorous and informed and giving it depth. Walton Ford’s artwork is a good example: his technical skill as a painter is extraordinary, but what I like about his paintings is how smart they are, with layer upon layer of history and science behind the imagery. [biocreativity] Tell us more about your current art-science work. [LS] I think of my work as portraiture, but focused on animals rather than people. I’ve done a number of series, such as fish and other sea creatures, sea turtles, walruses, toads, and wildlife found in New York City. Each print is a collective portrait of a species, although they’re often based on photos or observations of one individual. In very broad terms, the purpose of a portrait is to allow the viewer to know the subject, to convey a sense of identity. And at the risk of anthropomorphizing animals (which is not my intention), I want my prints to allow the viewer to get to know the animal. I like to focus on the obscure (most people don’t know much about the variety of toad species), the unexpected (wild animals in urban areas that are not pigeons and rats), and species that are endangered or face serious conservation concerns. The Time Has Come. 2006. Reduction woodcut print by Lisa Studier. [biocreativity] I love your NYC wildlife series! I also think your prints are a great way to get people thinking about diversity and endangered species. What inspired you to do these portrait series? 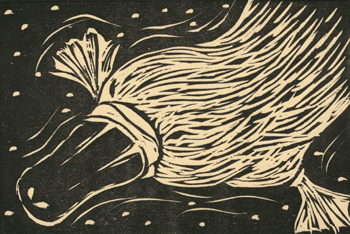 [LS] I started out with a fish series, and was inspired by a lot of reading I did on environmental issues affecting the ocean and destructive fishing practices that are endangering marine species; two books that stand out are The Empty Ocean by Richard Ellis and The Unnatural History of the Sea by Callum Roberts. I’ve also been inspired by natural history illustrators like John James Audubon, Mark Catesby, Ernst Haeckel, and Maria Sybilla Merian (and I’m very fortunate to be able to look at some of their work in my library’s collection), and contemporary artists like Walton Ford, Chris Jordan, Kiki Smith, and Brandon Ballengée. Wolf Eels. 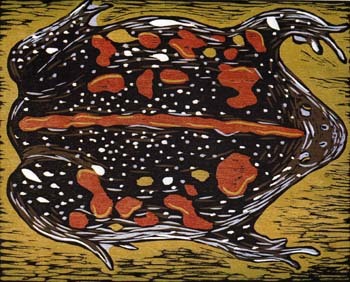 2004 Reduction woodcut print by Lisa Studier. 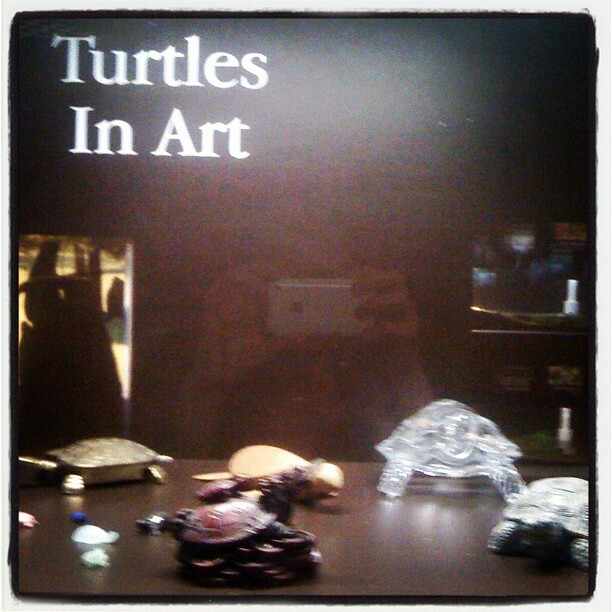 [biocreativity] It must be wonderful to have access to so much great art at work! I think the biocreativity readers will also love learning more about the contemporary artists you mention. Lisa, what is the most important thing that you want others to know about your work? [LS] People respond well to my artwork because animals are often endearing and they touch something in us, but I strive for my prints to be more than just cute animal pictures. I do a huge amount of reading and research about each species so that I can talk intelligently about it, and when I show my work I try to include information, particularly about any conservation issues, whenever possible. Of course people take away what they want from it, and that’s fine, but it’s important to me that the work comes from an informed place. Mexican Burrowing Toad. 2010. 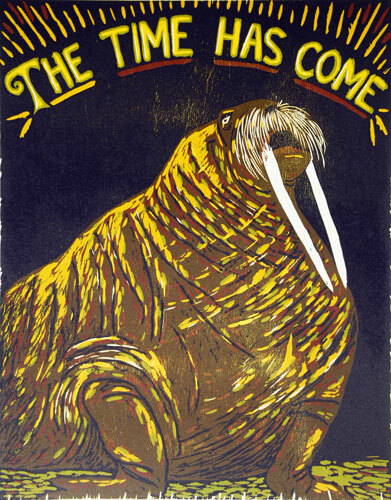 Reduction woodcut print by Lisa Studier. [biocreativity] I think that providing that information along with your art is a great way to help communicate science (more on that at the end of the post…)! What is the most common question or comment you get about your work? [LS] How do you have the patience to do that?? 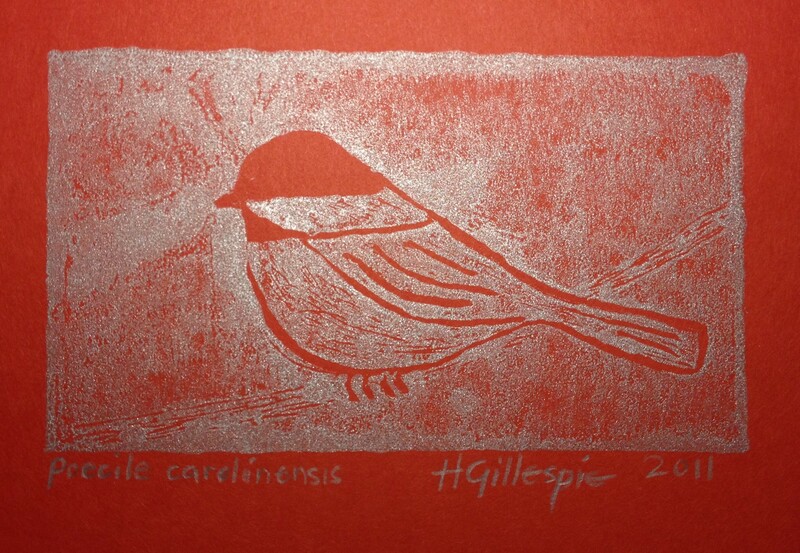 Which is funny to me, because I don’t necessarily think it takes more patience than any other artistic medium, but I guess printmaking techniques can seem mysterious and complicated, and multi-color woodcuts have a lot of steps in the process so it might seem like it requires an exceptional amount of patience. But when I look at scientific illustration, the level of detail and precision just amazes me, and I don’t think I’d have the patience for that! 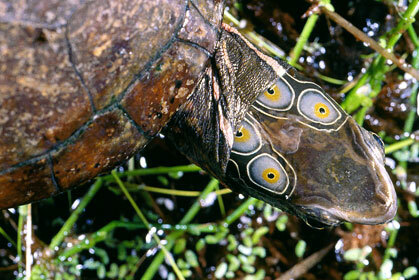 Eastern Box Turtle. 2009. Reduction woodcut print by Lisa Studier. 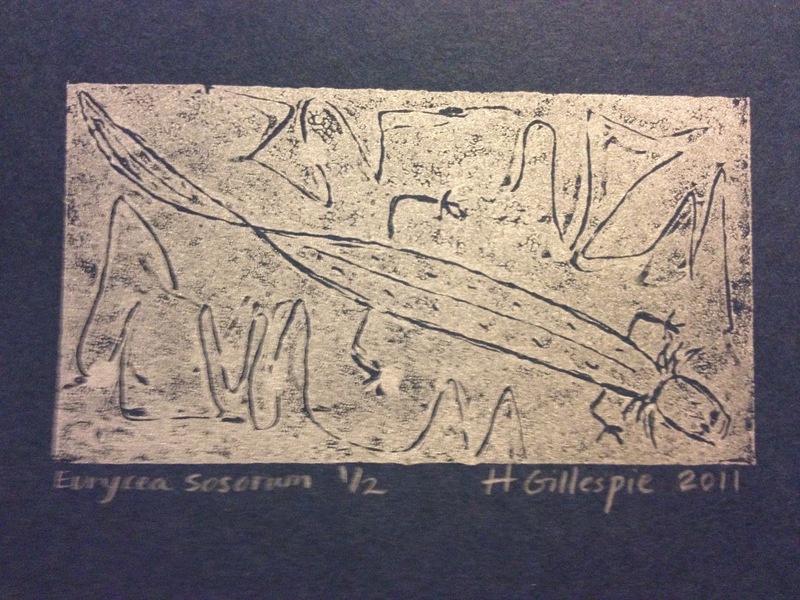 [biocreativity] Can you tell us a little bit more about the woodcut process? I work primarily in the reduction printing technique, where a single woodblock is gradually cut away in-between each color pressing, leaving it destroyed by the end of the process with a closed edition of prints. Working with the wood grain and watching the image emerge and become more defined as each color is printed gives me a sense of getting to know the creature, and a feeling for its fragility and sentience. I hope that my prints will spark an interest in the animals and a desire to learn more about them. There is an excellent video on YouTube featuring Santa Cruz artist Bridget Henry demonstrating the reduction printing technique. [biocreativity] It’s a really great video and definitely illustrates the patience and skill required for reduction printing! Lisa, what’s next for you in art + science? Will you be expanding your portrait series? [LS] I plan to expand on my toad series, and I’m also looking into and reading about endangered snakes (my first print for this series is the New Mexican Ridge-Nosed Rattlesnake) and sharks. And last year I had a show where I created a big wall installation that combined statistics on amphibians from the IUCN Red List of Threatened Species with layers of cut-out prints, so I’m mulling over some ideas on how to expand and improve on that piece. Great Plains Toad. 2010. 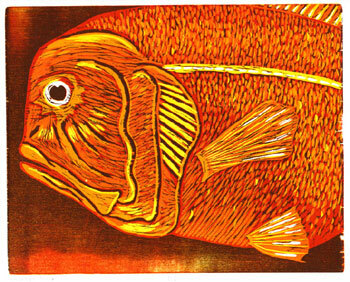 Reduction woodcut print by Lisa Studier. 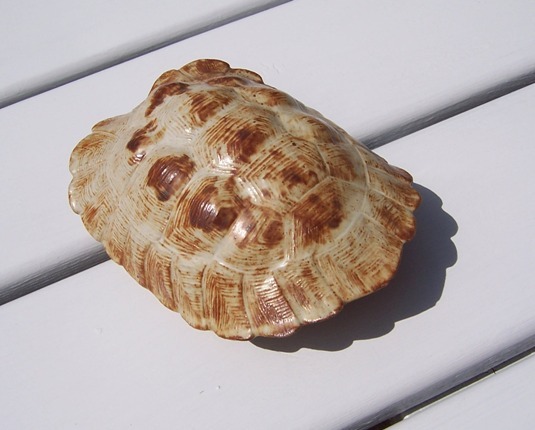 [biocreativity] Snakes and sharks sound great! You know, all of this reminds me of an ECOLOG (The Ecological Society of America’s listserv) thread this week, “Global Emergency: What Can I Do?”. It started with a forwarded message (originally by Paul Erhlich) which called on scientists to help “do something” to help make the world more aware of the current global crises of overpopulation, climate change and biodiversity loss. A few responses have been uplifting, but I have found many more to be rather pessimistic or at a loss for what to do in a world where ecologists are so vastly outnumbered by non-ecologists. It seems to me that we should all be using our own individual and varied talents and affinities to help spread awareness of global ecological issues. I believe artists like yourself have a tremendous power to engage people who otherwise might ‘glaze over’ in response to a strictly science approach. I suggest that one thing we can all do is to spread the word about you! Lisa, do you have a website that you’d like the biocreativity readers to know about? San Francisco Garter Snake. 2007. 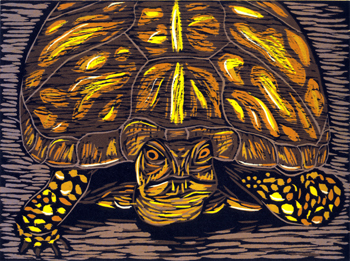 Reduction woodcut prints by Lisa Studier. Click on the image for a slightly larger version. 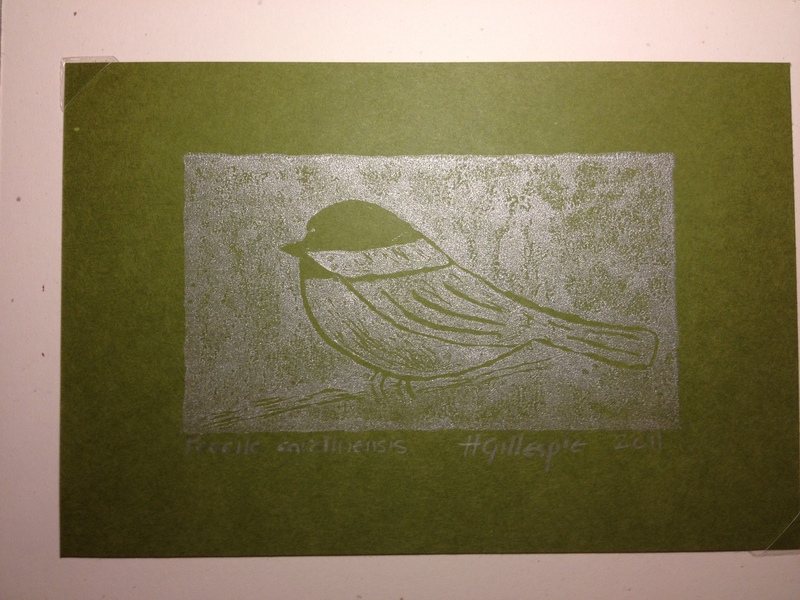 [biocreativity] Lisa, thanks so much for sharing your prints with us on the biocreativity blog. I really can’t wait to see what comes out of your studio next! Well, it seems that I’m on a role with scientific illustrators on the ECO Art + Science series here on the biocreativity blog! Back in October, I got an enthusiastic email from a recent graduate of Bennington College in Vermont who studied both Natural Science and Visual Art. Her illustrations of natural objects blew me away and I immediately suggested we get started on a post for this series. Her work is so hot-off-the-press that we had to gather some images of her work first. 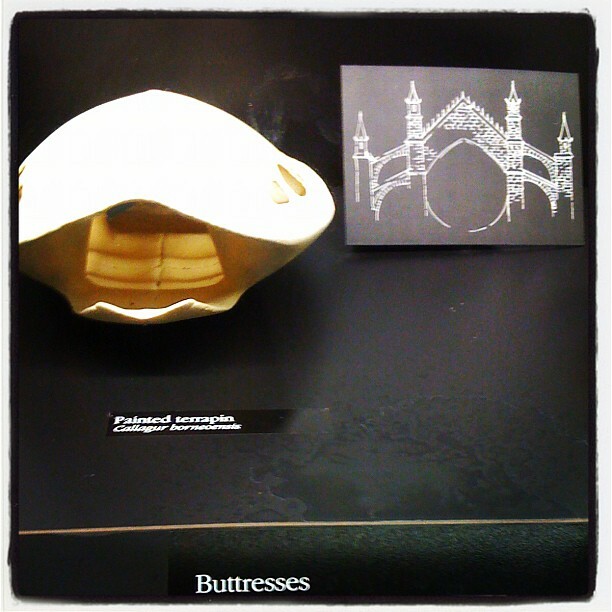 “Some of my work is currently hanging in a show at Bennington College,” she informed me. So, now that we have digital images of the work of this budding illustrator to share here on the biocreativity blog, and her website is now up and running, I’m thrilled to feature the work of illustrator Stephanie van Ryzin. [biocreativity] Welcome to the biocreativity blog, Stephanie! I think I’ve taken up enough time with my impressions of your work. How would you describe your work, interests and profession? [SvR] I recently graduated from Bennington College where I studied both Natural Science and Visual Art. My true love lies in the natural world, and is where my interests in both science and art originate. I am particularly interested in the relationship between the natural world and the built environment, and conflicts between people and wildlife. I intend on going back to graduate school in a few years for either wildlife or conservation biology. However, I am also interested in scientific illustration, and would hope to eventually use these skills in conjunction with my research. 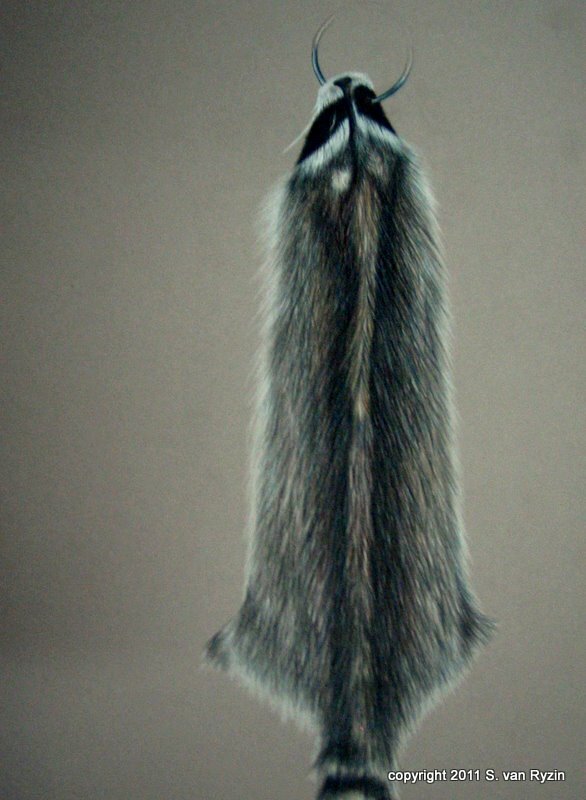 Racoon Pelt. 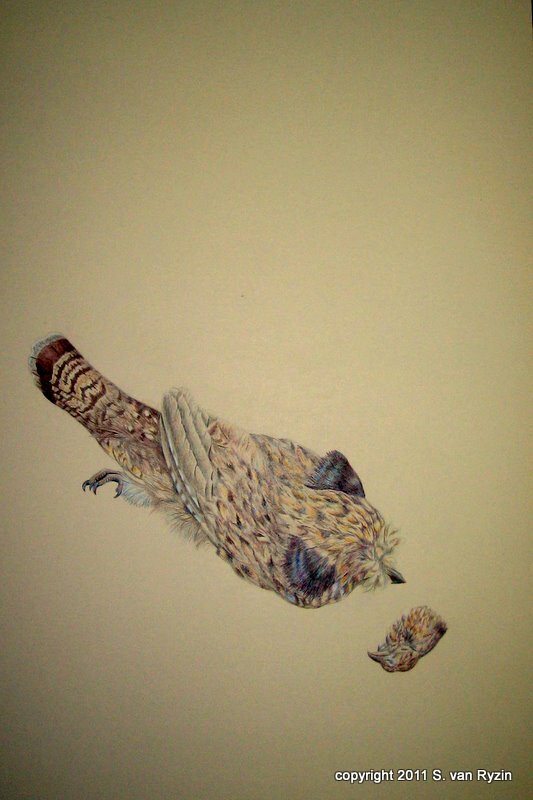 Colored pencil on paper by Stephanie van Ryzin. 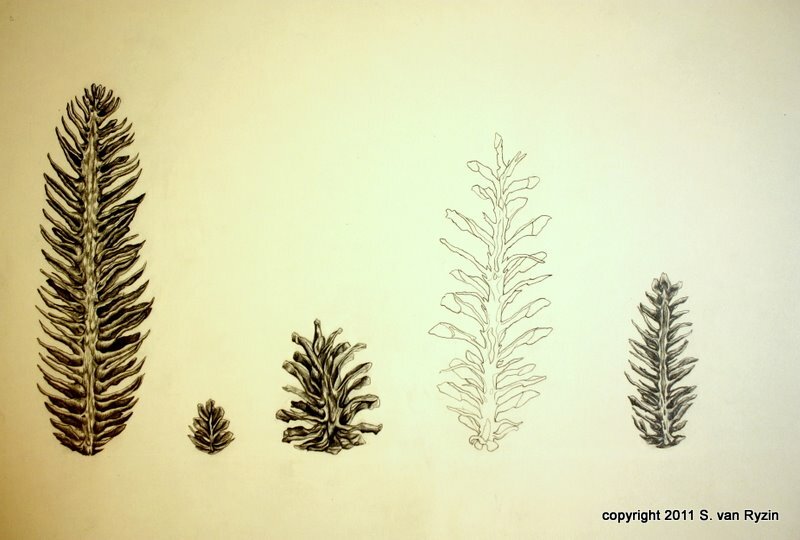 [biocreativity] You should check out the scientific illustration program at California State University, Monterey Bay that I discussed in the last ECO Art + Science article with illustrator Emily M. Eng. I think you’d be a stellar candidate. Stephanie, where do you see yourself on the biocreativity spectrum? What is your primary training (art or science)? [SvR] The arts and sciences are very much intertwined in my mind, but I think I do fall closer to the science end. In college my coursework always fell heavier on the sciences, as do my intentions for graduate school, but I find the more I am involved in the science the more inspiration I have with my art. Mexican Grey Wolves. Colored pencil on cardboard by Stephanie van Ryzin. 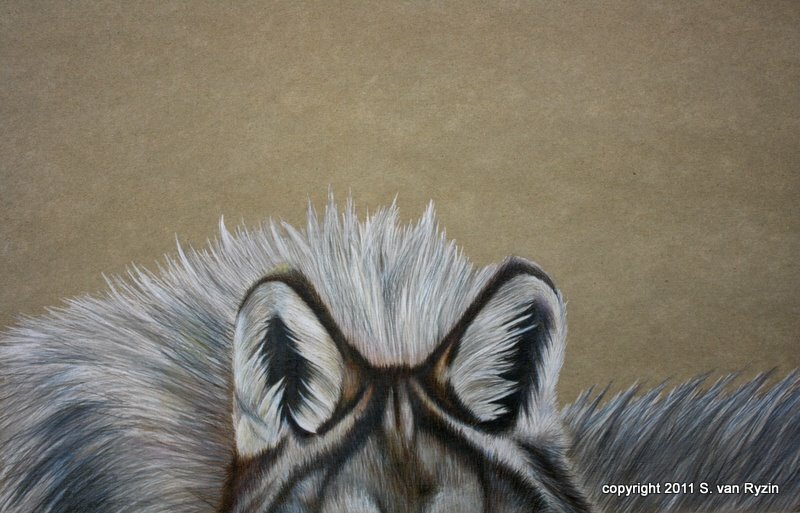 Mexican Grey Wolves (detail). Colored pencil on cardboard by Stephanie van Ryzin. [biocreativity] How do you view the interaction of arts and sciences? What’s your take on how these disciplines interact? [SvR] I believe the arts and sciences both sit on the common ground of observation, and can be powerful combinations when used together. For me, drawing is about seeing. It is about being able to observe something and accurately document it, and in this way serves as a tool for scientific inquiry. A lot of art and design I am interested in attempts to replicate images and ideas found within the natural world; I think both art and science share this similar curiosity. [biocreativity] Can you please describe your art for the biocreativity readers? [SvR] Within the visual arts I studied both drawing and architecture. The kind of drawings I tend towards are highly detailed observational drawings of natural objects that isolate a specific pattern or system within the object. In my work with architecture I have been particularly interested in connections between biological systems and architectural ones, and applying isolated systems from my drawings to larger architectural concepts. Pine Cone Sections. Graphite on paper by Stephanie van Ryzin. 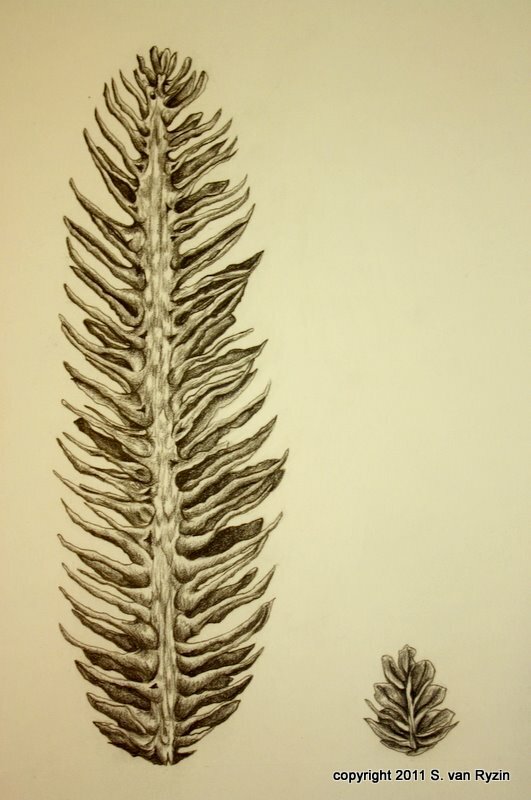 Pine Cone Sections (detail). Graphite on paper by Stephanie van Ryzin. 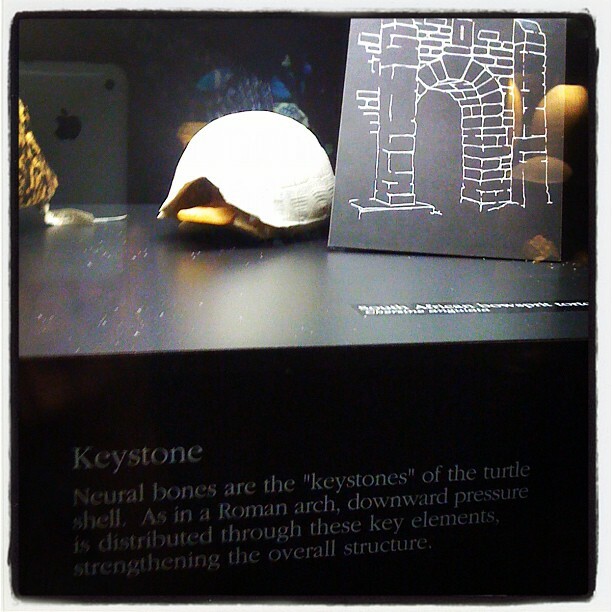 [biocreativity] I think you’d love one of the current exhibits at the Tennessee Aquarium about turtle shells and architecture (a biocreativity post about that exhibit, Turtles: Nature’s Living Sculptures—Architecture in Bone, is coming soon)! What are your other inspirations? [SvR] My inspiration has been an evolving process, and one that I think has benefited greatly from my experience at Bennington. 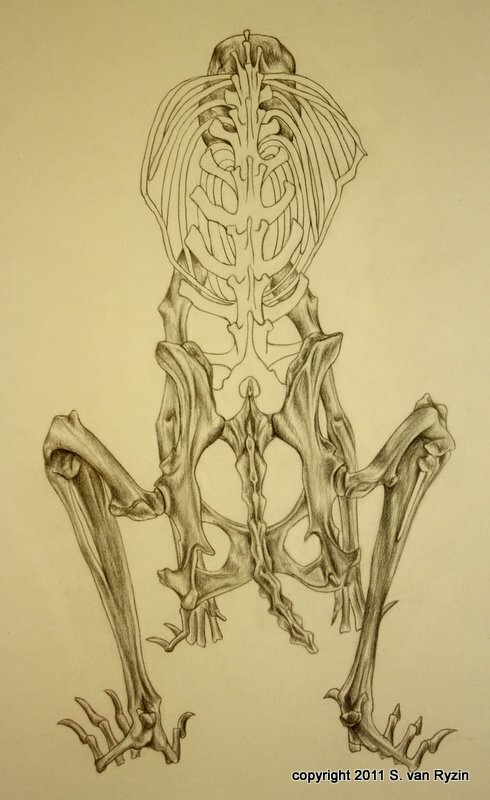 I was challenged in my education at Bennington to synthesize my own connections between the natural sciences and visual art, which has manifested in my studies with architecture as well as scientific illustration. I have come across several influential people and projects that I have found confirmation and further inspiration in. 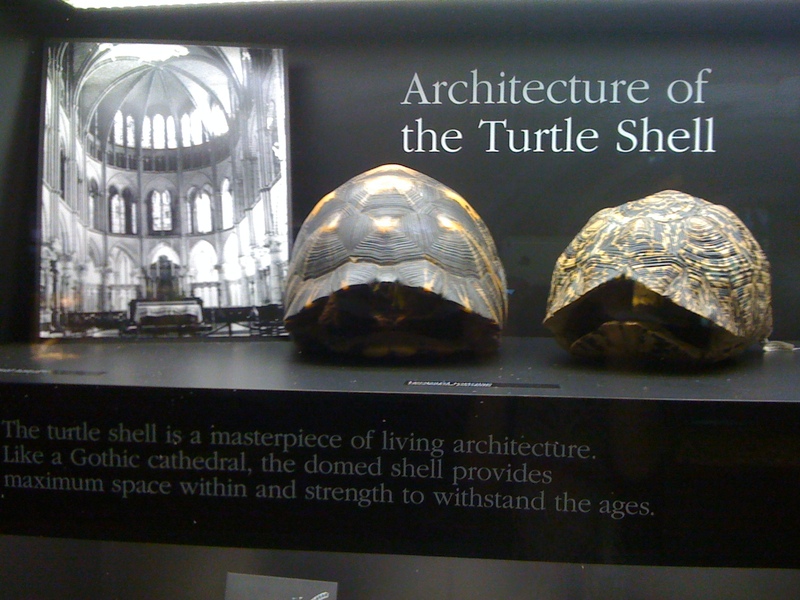 Nature and the Idea of the Man Made World by Norman Crowe, and The Evolution of Designs, Biological Analogies in Architecture and the Applied Arts by Philip Steadman are two books I have found extremely relevant to my work. 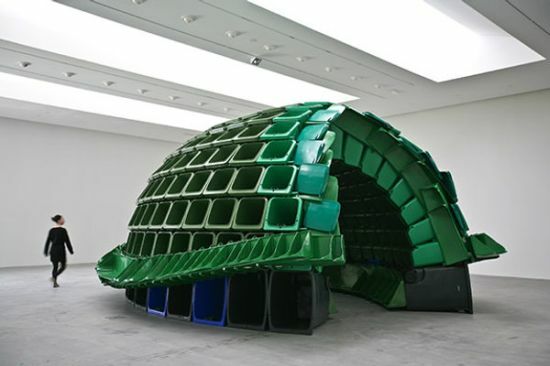 I have also been very interested in the work of Patricia Johanson, who uses similar applications of drawings to architectural design in creating ecosystems for both people and wildlife. Ruffed Grouse. 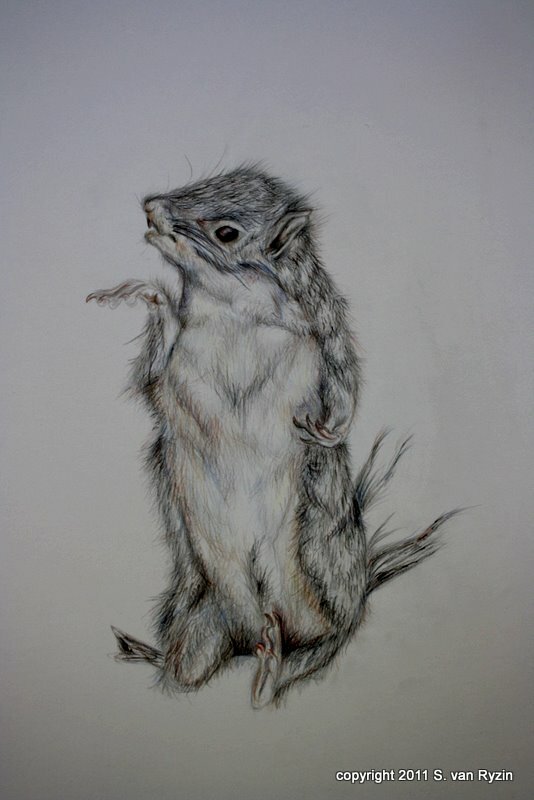 Colored pencil on paper by Stephanie van Ryzin. [SvR] Observation, curiosity and patience are words that really resonate with me. Having your eyes open, being aware of changes and patterns and consistencies in the natural world, practicing patience and having the curiosity to keep looking I think are foundations for living, let alone good science and art. [biocreativity] That may be the most beautiful statement yet to appear in this series, Stephanie. I completely agree. When you show your work to others, what is the most common question or comment you get about your work? [SvR] A lot of times when I show someone a drawing the response I get is, “How much time did that take you”? I don’t think I spend an absurd amount of time on one particular drawing, but I can be a bit obsessive over detail. 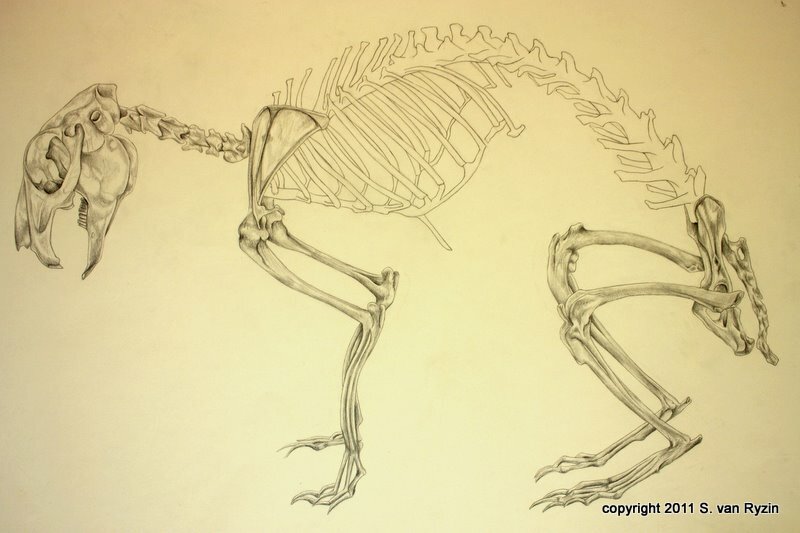 Rabbit Skeleton. Graphite on paper by Stephanie van Ryzin. [biocreativity] Stephanie, do you have a website where readers can see more of your work? 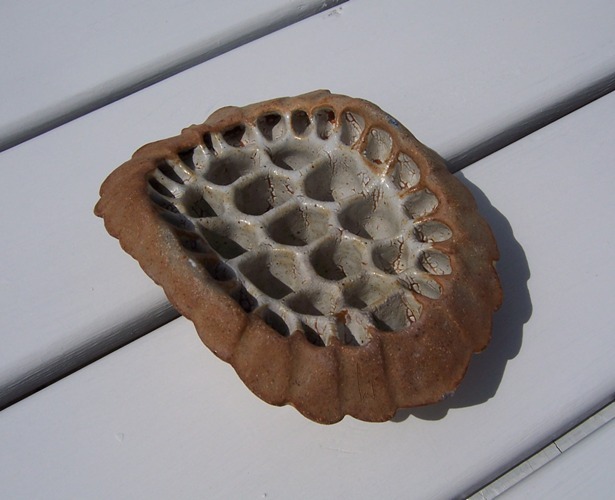 Yes, I just created a website: http://www.wix.com/sjvanryzin/naturalart#! [biocreativity] What’s next for you in art + science? Where do you see your work going, or what would you like to do next? [SvR] I am currently looking to become involved with either wildlife or conservation biology research, and get more hands-on field work experience before I commit to graduate school. I would ideally love to be able to use my art in conjunction, and something that I am wanting to work more on are drawings that speaks to issues in wildlife and environmental conservation. [biocreativity] Well, I can’t wait to see what comes next, Stephanie. Best of luck to you in your graduate pursuits. I think your skills as an artist will really serve you well in graduate school, especially when it comes to communicating your work to others. 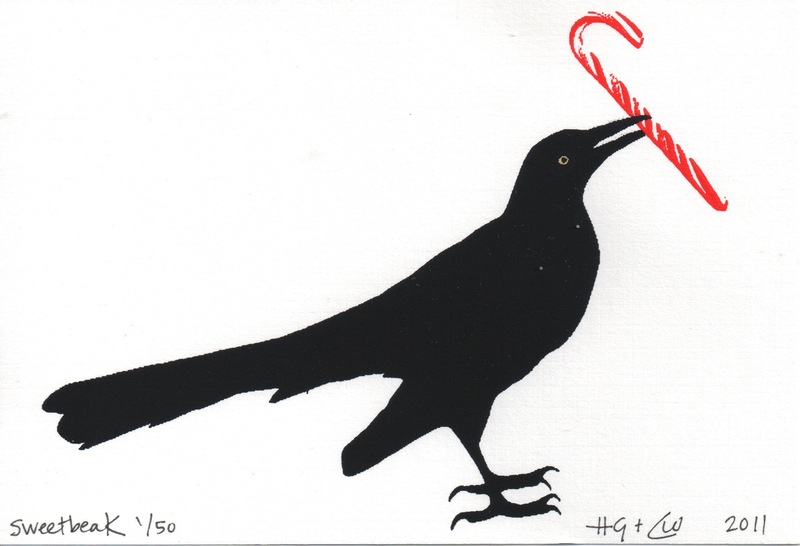 Thanks so much for sharing your talents with us on the biocreativity blog! Grey Squirrel. 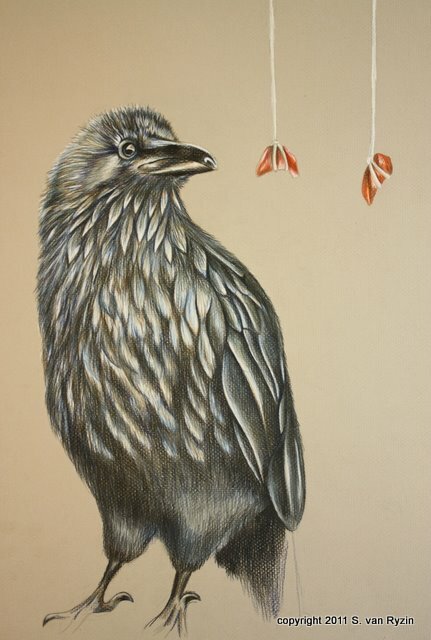 Colored pencil and graphite on paper by Stephanie van Ryzin.